The time has come for the Tribe to leave their hideaway for new horizons. As a clan leader, you will need to guide the migration of your prehistoric people through the Valley. You will harvest food by hunting and gathering, find large and protective caverns in anticipation of winter, interact with other nomadic groups ... Gather your tribe and go to the discovery of the Valley! Sapiens is a short and easy-to-access game for a family audience, with enough depth to appeal to gamers. 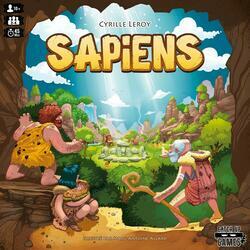 Sapiens is a board game for 2 to 4 players, from 10 years old.